Lobsters have an open circulatory system with haemolymph that contains microorganisms even in the healthy individuals. 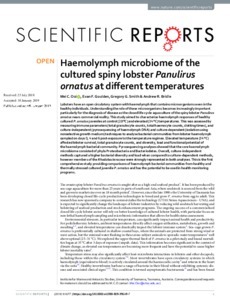 Understanding the role of these microorganisms becomes increasingly important particularly for the diagnosis of disease as the closed life-cycle aquaculture of the spiny lobster Panulirus ornatus nears commercial reality. This study aimed to characterise haemolymph responses of healthy cultured P. ornatus juveniles at control (28 °C) and elevated (34 °C) temperatures. This was assessed by measuring immune parameters (total granulocyte counts, total haemocyte counts, clotting times), and culture-independent (pyrosequencing of haemolymph DNA) and culture-dependent (isolation using nonselective growth medium) techniques to analyse bacterial communities from lobster haemolymph sampled on days 0, 4 and 6 post-exposure to the temperature regimes. Elevated temperature (34 °C) affected lobster survival, total granulocyte counts, and diversity, load and functional potential of the haemolymph bacterial community. Pyrosequencing analyses showed that the core haemolymph microbiome consisted of phyla Proteobacteria and Bacteriodetes. Overall, culture-independent methods captured a higher bacterial diversity and load when compared to culture-dependent methods, however members of the Rhodobacteraceae were strongly represented in both analyses. This is the first comprehensive study providing comparisons of haemolymph bacterial communities from healthy and thermally stressed cultured juvenile P. ornatus and has the potential to be used in health monitoring programs.